well they didn't. They had a big one. One Sunday they took us to Cedar Rapids to the airport. When we got in the car here was the birthday cake. We couldn't find a box so we put it in a long see-through plastic bag, and I carried it. Wasn't that cute? I just couldn't resist it. I carried it all the way home and got a big bang out of it. 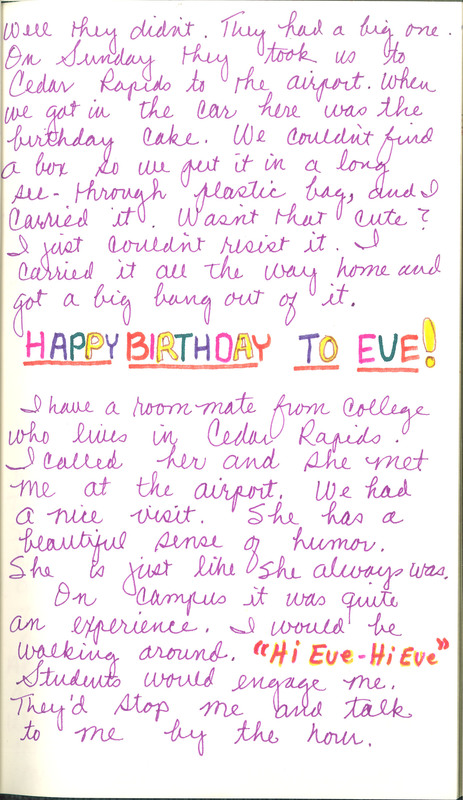 HAPPY BIRTHDAY TO EVE! I have a roommate from college who lives in Cedar Rapids. I called her and she met me at the airport. We had a nice visit. She had a beautiful sense of humor. She is just like she always was. On campus it was quite an experience. I would be walking around. "Hi Eve - Hi Eve" Students would engage me. They'd stop me and talk to me by the hour.